Big Walnut’s Autumn Imhoff fires to first to complete an inning-ending double play during a non-league showdown against Olentangy Orange Wednesday in Lewis Center. LEWIS CENTER – In a game that seemed to be a tailor-made slugfest, it was pitching that won the day. The Big Walnut softball team has been an offensive juggernaut with 50 runs over its first three games – all five-inning run-rule victories. Olentangy Orange’s offense was seemingly on an offensive upswing too. The Pioneers produced 17 runs in Tuesday’s win at Franklin Heights. Instead, Autumn Imhoff led the Golden Eagles to a 3-2 win in a pitcher’s duel at Orange Wednesday in non-league action. Imhoff gave up a pair of walks, hit a batter and struck out two, including one with the tying run on third and the winning run on second for the game’s final out. 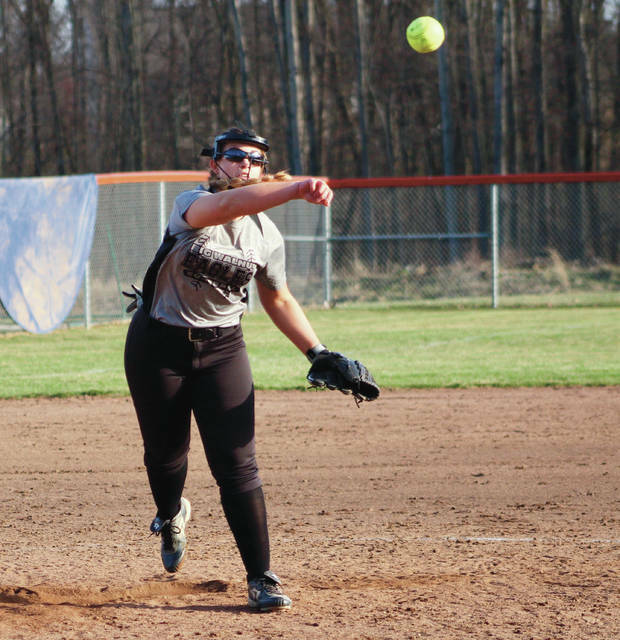 The junior out-dueled Orange’s Brenna Oliver – fresh off a five-inning no-hitter in a win at Franklin Heights Tuesday. The Eagles (4-0) ended any threat of a repeat performance by Oliver when Hailey Krinn led off the game by lining the second pitch down the left field line for a double. Krinn moved to third on a groundout and scored on Molly Sharpe’s two-out triple to give the Eagles a 1-0 lead. The Pioneers got it right back. Teresa Hawk led off the bottom half with a bloop single and moved to second on an error. She moved to third on a Morgan Woycitzky sacrifice bunt and scored on a Riley Jestadt groundout to tie the game 1-1. It stayed that way until the fifth when Tatum Bardash got hit by a pitch to lead off. She went first to third when Kinleigh Hill reached on a sac bunt error before Brenna O’Reilly brought her home on a squeeze bunt to give the Pioneers the lead. But the Eagles came right back in the sixth. Sharpe reached on an infield hit with one out and scored on Jocelyn Lucas’ triple to tie the game. Lucas scored the go-ahead run on a wild pitch. Imhoff set down eight batters in a row from the second inning until the fifth and faced the minimum in the sixth when she snared a come-backer and threw to first to complete an inning-ending double play. Oliver allowed seven hits and no walks and struck out two in a complete game, but took the tough-luck loss for the Pioneers (2-2). Next up, Orange hosts Upper Arlington in non-league action Friday at 5:15 p.m. Big Walnut travels to Olentangy Berlin Saturday for a non-league tri-match. The Eagles face Grandview Heights at 1 p.m. and will play the host Bears at 3 p.m.